Tesla has announced new versions of its Model S and Model X electric vehicles, imbuing both cars with faster acceleration and extended range thanks to a 100 kWh battery. The Model S P100D with Ludicrous mode is the third fastest accelerating production car in the world, according to Tesla, only behind the limited production and obscenely expensive LaFerrari and Porsche 918. The electric car can go 0-60 in 2.5 seconds, down from the vehicle's previous acceleration rate of 2.8 seconds. Tesla's brand-new 100kWh battery - 10 kWh higher than the company's last battery improvement - is key to the EV's new prowess, plus it extends its range to an estimated 315 mile EPA/613km EU. In other firsts, that distance makes it the longest-range production EV and the first to go above 300 miles, Tesla says. The Model S P90D had a range of 270 miles by EPA standards, though the 90D could hit 294. The Model X crossover is also receiving a 100 kWh battery upgrade, helping extend its range to 289 miles EPA/542km EU over the P90D's 250-mile range. With Ludicrous mode, the Model X P100D can hit 60mp in 2.9 seconds, faster than its previous mark of 3.2 seconds. As for price, it's steep for both vehicles. The Model S P100D starts at $134,500 (about £101,925, AU$176,625), while the Model X P100D gets going at $135,500 (about £102,680, AU$177,940). Customers who've ordered a P90D Ludicrous but not received it yet can upgrade to a 100 kWh battery for $10,000 (about £7,580, AU$13,135). If you already own the older model, you can upgrade for $20,000 (about £15,160, AU$26,265). The swap is more expensive because the existing 90 kWh battery will need to be recycled. Clearly aware of how high-end those prices are, Tesla reasons the expense has benefits further down its product line. 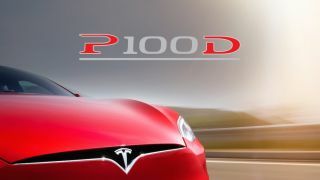 "While the P100D Ludicrous is obviously an expensive vehicle, we want to emphasize that every sale helps pay for the smaller and much more affordable Tesla Model 3 that is in development," Tesla says. "Without customers willing to buy the expensive Model S and X, we would be unable to fund the smaller, more affordable Model 3 development." Tesla plans to keep production of the new batteries limited to about 200 per week, at least to start. Customers can begin ordering one today.